A twist on a cheesecake. 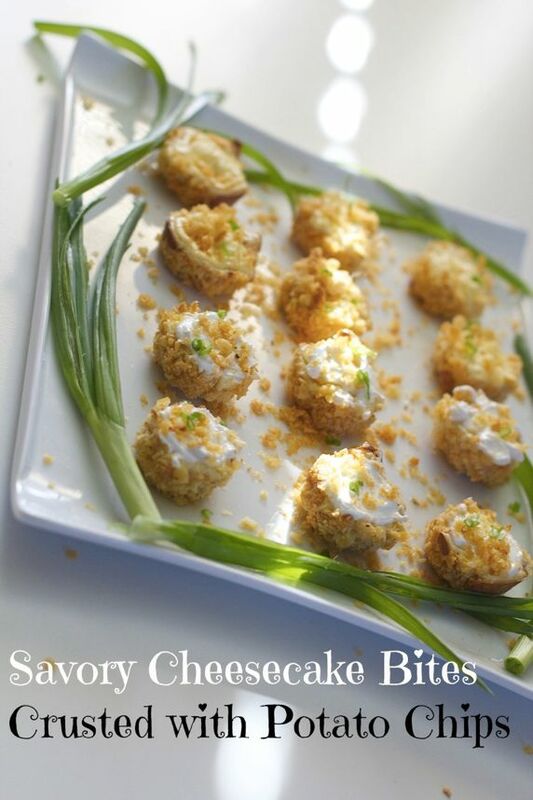 These are bite sized, crusted with potato chips, and flavored with spring onions. 6 spring onions, sliced, sauteed in a little butter just until softened, not browned. 2 spring onion, chopped finely for garnish. Use as little or as much as you like. Crush potato chips and mix with melted butter. You can use food processor or use a plastic bag. Put one tablespoon of potato chip mixture in each individual muffin tin. Using a shot glass, press down until the potato chip mixture is on sides, making sure you have some on bottom. Bake at 400 for 4 minutes. Cool. Using beater, mix cream cheese until very smooth. add eggs one at a time. Add in cayenne, garlic powder, salt, pepper, sour cream and flour. Mix thoroughly. Add in cream cheese mixture to potato chip mixture. Bake at 400 for 4 minutes. Turn heat to 250. Bake 6-8 minutes more.Turn off oven. Open oven and allow to bites to cool for 10 minutes. If the cheesecake bites crack, don't worry. You can top with sour cream. Cool. Optionally top with sour cream and chopped spring onion. You can also sprinkle some potato chip crumbs if you desire. Refrigerate until ready to serve. Take out 10 minutes before serving. Recipe makes about 30.